Overcast. A stray shower or thunderstorm is possible. High 82F. Winds SW at 5 to 10 mph..
Showers this evening, becoming a steady rain overnight. Thunder possible. Low 58F. Winds S at 5 to 10 mph. Chance of rain 80%. Submitted/Participants enjoy the 2018 Tour de Coal. 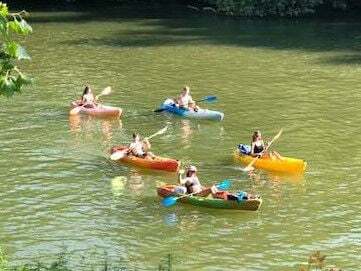 St. ALBANS, W.Va. - One of the nation's largest kayak river float events is ready to celebrate its 15th anniversary on June 15. "Planning is well under way to make this classic river event again one of the biggest and best in the U.S.," said Bill Currey, co-founder of the event and the Coal River Group. "The 15-year celebration of the clean Coal Rivers offers a reason to celebrate and promote the long-term work of the Coal River Group, a local volunteer non-profit organization. The proof of our success is the number of paddlers who have participated annually for 15 years. We estimate that the Tour De Coal has introduced well in excess of 10,000 paddlers to the river." Coal River Group has worked to clean up and improve the Coal River System. The payoff and success are exhibited by the 1,600 paddlers who joined together last year to celebrate the beauty and grandeur of the clean Coal River between Tornado, West Virginia, and St. Albans, West Virginia. The paddle event is for everyone. Some people choose to paddle fast, others just float and let the river take them to the finish line. It is not a race, but rather a day set aside to celebrate an important local asset, the Coal River. In 2018 the Coal River Group joined together with the City of St. Albans to help that city take advantage of the huge influx of paddlers representing over 18 states. Together they created the YAKFEST event that runs concurrently with the Tour de Coal and provides the paddlers with two days of music, food and exhibitors representing every aspect of kayaking, fishing, art and river services. The local restaurants, bars and businesses love the event, which brought over 8,000 visitors to the community last year. "The economic value to a small region like the Coal Rivers is estimated to be in excess of half a million dollars," Currey said. "The fact is, the one-day Tour de Coal kayaking event coupled with the two-day YakFest with its entertainment, food, craft beer and vendors creates income for all the local businesses starting now. The preparation of the Tour de Coal alone involves dozens of local businesses. We print and distribute over 1,600 shirts for the event. Then YakFest has its own shirts. We spend thousands of dollars for advertising, banners, set ups and physical improvements for our boat launches. Local hotels, Airbnbs, kayak sales and sporting goods stores along with hundreds of small businesses experience the financial windfall from our success. Of course, the real win is the fact that these events fund the continuing cleanup of all our local rivers and streams." Visit coalrivergroup.com to register early for the Tour De Coal.